Catton Grove Primary School is only a 25-minute bus ride from the Norfolk coast but up until two years ago some pupils and their parents had never been to the beach. A number of them had never visited a farm or seen a herd of cattle either. All that is changing now though – thanks in part to an initiative launched by Fiona Sadler, Catton Grove’s pastoral lead and parent support advisor. With the backing of headteacher Tim Lawes, Ms Sadler came up with the idea of running a Life Skills course for parents. Ms Sadler had delivered a series of parenting classes at the 750-pupil Norwich school in the past but realised that a new course focusing on practical skills like cooking, budgeting and eating healthily would help the most vulnerable parents – and benefit their children too. The Country Trust, a national education charity dedicated to bringing the working countryside alive for disadvantaged children, has played an important role. The charity already organises farm visits for different year groups at Catton Grove, helps the children to grow vegetables in the school garden and teaches pupils to cook soups and stews with them afterwards. When the charity first started working with Catton Grove, Ms Sadler suggested that the Life Skills parents should be involved in activities like farm visits as well. Ms Sadler, a former teaching assistant, has worked at Catton Grove for 18 years. Situated in a disadvantaged area on the outskirts of Norwich, the school has 338 Pupil Premium pupils and 174 on free school meals. Many parents attended the school themselves and some rarely venture beyond the local area. The Life Skills sessions started in January 2016. Each course runs for 20 weeks and Ms Sadler works with six parents at a time (many lack confidence and have struggled with mental health issues in the past). The group assembles in her Catton Grove office at 9am for the weekly sessions, just after parents have dropped their children off at school. The classes run until 11:20am, enabling those with young children to meet them from the school’s nursery. During the first course, the Country Trust delivered four sessions to parents, detailing the components of a healthy diet and the nutritional values of different foods. The charity also brought in a selection of vegetables for them to use in their cooking. As well as running classes on money management and budgeting, Ms Sadler took the parents shopping and showed them where they could buy fresh produce and what they could cook with it. As the parents grew in confidence Ms Sadler suggested a trip to the seaside, an activity they could replicate with their children. The group planned the outing to Cromer themselves, working out the cost, how to get there, what to do if the weather was terrible and how to prepare a healthy picnic. The trip was such a success that some of the mothers met up during the school holidays and spent the day at the beach with their children. Ms Sadler also got the parents to plan, budget for and cook a three-course meal. The first cohort prepared melon with a selection of salads, a meat platter, pasta with meatballs, homemade garlic bread, sweet potato wedges, fruit salad and chocolate pudding and invited the head and deputy head along to join them. They also hosted an afternoon tea for the governors. “I wanted to build parents’ relationships with the staff so they didn’t feel so daunted,” explained Ms Sadler. The Life Skills classes have clearly had a huge impact on parents and their children. So far Ms Sadler has run one course for mums, another for dads, and in September she launched a mixed one. The parents who have taken part so far have grown in confidence, developed their skills and learned how to interact with their children. “Now the parents go home and do the cooking with their children,” said Ms Sadler. “Sometimes the relationship between parent and child wasn’t the greatest because they thought everything had to be about taking the children out somewhere and spending money. Life Skills is about saying ‘you can have fun at home – and cooking is a good way to do that’. The children’s lunchboxes became healthier, they were being fed better at home and because the parents felt better in themselves the mood of the children seemed better too. We’ve noticed that the children are doing more outside activities, whether it’s going to the local Brownie pack or getting involved in football in the community. At the end of each course, Ms Sadler asks the parents for their feedback – and the comments have been glowing. Another mother said that changing her diet and learning to cook for her family had helped her to lose four stone after being diagnosed with Type 2 diabetes. “My children are happier and more confident because I am,” she wrote. Meanwhile, a single father whose wife died 18 months ago said that before he attended Life Skills he had no motivation and felt unable to mix with other people. 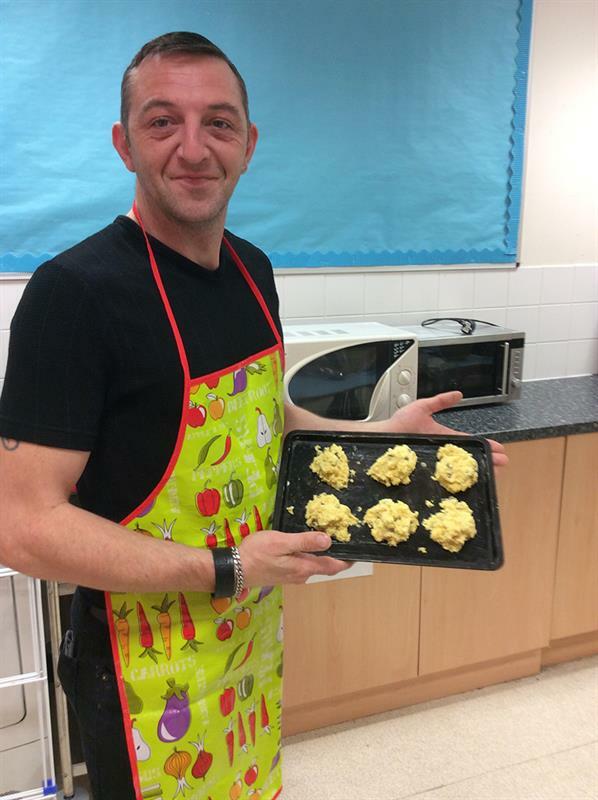 Now he enjoys cooking and takes pride in planning and preparing low-cost meals for himself and his two children. The Catton Grove staff are so delighted with the impact of Life Skills that they are keen to share their work with other schools. Three parents recently spoke to other schools and agencies about the way in which Life Skills has changed their lives and the Country Trust is making a DVD to showcase the project. “We’re not about keeping it to ourselves,” said Ms Sadler. “Yes, Life Skills was my idea but I was very fortunate in working in a school where the headteacher recognises the importance of working with everybody, not just the children. Emma Lee-Potter is a freelance education writer.